IM Miguel Mosquera is a rising player in the Columbian ranks, but Latin American players seldom get the attention they merit. 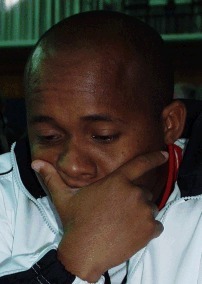 Mosquera has represented his country in three consecutive Olympiad tournaments (2000, 2002, 2004). Mosquera's first Olympiad experience was in Istanbul, Turkey where he scored 4-7, winning his only game on 14-move crush over FM Mok Tze Meng of Malaysia. In Bled, Slovenia, he improved to 5-4 holding a few strong players equal. His best result was at the Calvia Olympiad. In this tournament, he played eight Grandmasters, scoring 7½-4½ points for a 2539 performance and a GM norm. In this game, he faces Martha Mateus of Columbia This battle was a Najdorf Sicilian where Mosquera takes advantage of an opening error. The punishment is brutal.